Applications are now being accepted for Park(ing) Day 2013. Help to create a walkable, healthy city on Friday, September 20, when anyone can convert on-street parking spaces into a temporary mini-park from 9:00 am to 3:00 pm. Those interested in participating should submit a site plan and location description by August 30. A new app is available for Seattle residents to report potholes, graffiti, and other possible neighborhood offenses. The app, called “Find It, Fix It,” is now available for iphone and Android. One southbound traffic lane on Aurora Avenue N between N 67th and N 65th streets is now closed to traffic during non-peak travel hours for sidewalk improvement work. The closure, which will last through September, will allow for the construction of a new curb and sidewalk on the west side of Aurora Avenue N. Look for pedestrian detours around the construction site. Join the SDOT for an open house on proposed safety improvements on Green Lake Way North. The meeting will take place next Tuesday, August 20, from 6:30 to 7:45 pm at the Green Lake Branch Library. One conceptual artist in New York City is exploring the process of giving and receiving directions by asking passersby for hand-drawn directions, which he is piecing into an overall map of the city. Amtrak set a new record in July for the number of monthly riders, with more than 2.9 million passengers hoping aboard. Amtrak has set ridership records for the past 9 out of 10 years. Join the Federal Highway Administration (FHWA) and the Pedestrian and Bicycle Information Center (PBIC) for a free webinar on PEDSAFE, the Pedestrian Safety Guide and Countermeasure Selection System. The webinar will take place Wednesday, September 4, from 10:00 – 11:30am. Pedestrian error was found to be the leading cause of pedestrian fatalities in Las Vegas. Of the 29 pedestrians killed this year in the city, pedestrian error was the leading cause 83 percent of the time. A recent study done by researchers at UC Berkeley and Rutgers argues that transit produces agglomeration, or more people in the same place. They show that this results in a hidden economic value of transit worth anywhere from $1.5 million to $1.8 billion each year. A unique visual shows what the New York City subway system would look like from an aerial view. A cat station master is helping to bring tourism to Japan’s Kishi train station. The calico cat named Tama has served as Super Station Master since 2007. Since joining the station, the cat helped the previously failing system to make a tidy profit. The station now includes cat-themed train cars and a souvenir shop. A new app called Urban Buddy helps tourists to travel like locals. Urban Buddy uses knowledge from city residents in real-time, after users punch a question into the app. The app currently works via email, but an updated version should work more like a text messaging system. 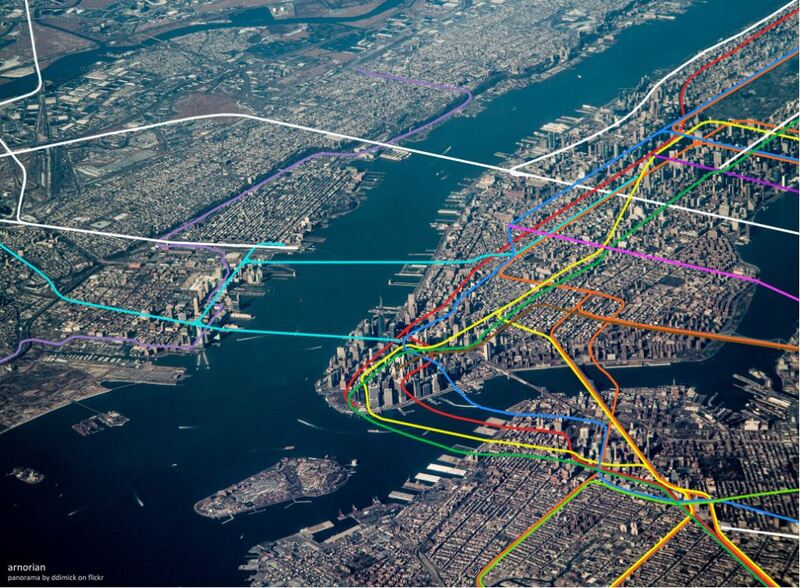 What does one of the busiest metropolitan transit network in the world look like as a map? View Tokyo’s metro map, which supports over 3 billion annual riders and has 9 lines with 179 stops.